I feel really proud these past weeks. I committed to really big complicated projects. I started on the promised date. I continued despite the obstacles ( and there were multiple ) that came my way. I stayed committed to the highest quality despite the original team being halved. I was honest and worked all the hours I could stay awake and move my tired bones to make the target. I still had the dishes washed, floors cleaned and kids foreheads kissed before I left for work. Of course, near the end I was cranky and even slept fully clothed (boots and all ) through a night when exhaustion caught up. But I made it. My clients were delighted. I may have even made some allies! When your self employed. That’s what it takes, the only person you can really REALLY truly rely on is just yourself. Because despite every obstacle that may come your way. The bills still gotta be paid, the kids still gotta be fed, the home still gotta be there. 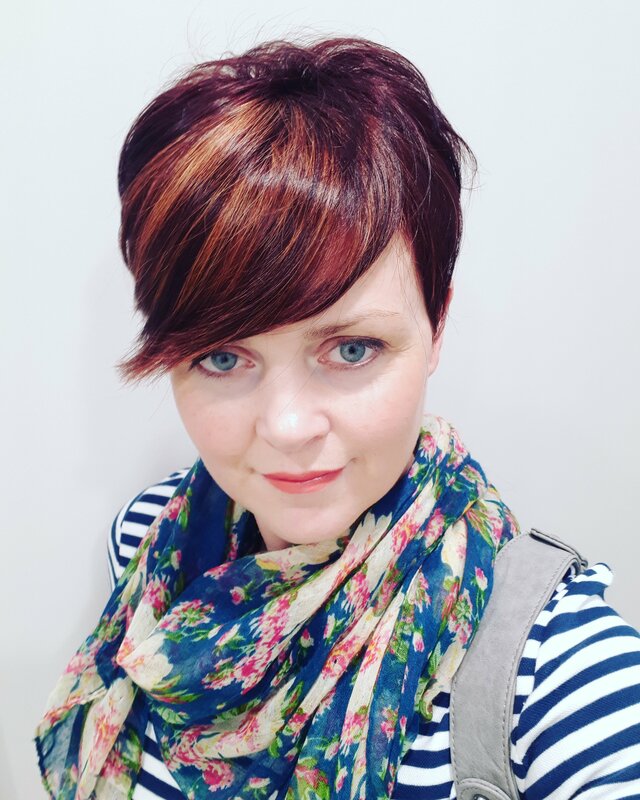 Then I rewarded myself with a fresh hairdo at Ash Hair Studio, Raheen, Limerick! Have a great Easter weekend every one! I woke with a start this morning at 5.30. I heard a knock and my sons voice calling me. Convinced he was outside the front door I leapt out of bed and ran to open it for him. Heart pounding I found no one there. My 14 year old asked me could he sleep over at a friends last night, and in my dream state I thought he had left his friends home and walked the 2 klm dark rural road to come home. He and I have a cantankerous parent – child relationship. 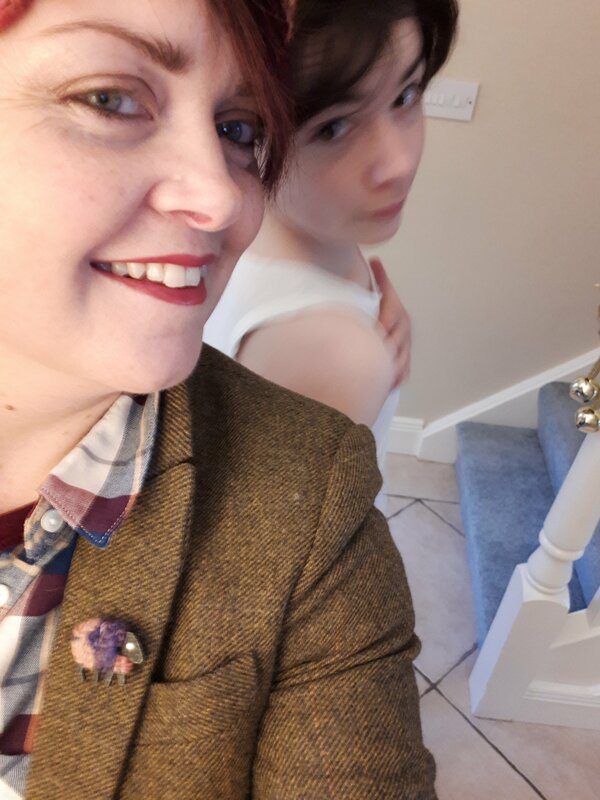 He has a strong, persuasive, personality and more often than I am happy about, we clash on matters about his behaviour and unwillingness to conform. He will find a way every day to grab the headlines in our home. But he is also the more outwardly sensitive, caring, empathetic, deeply affectionate child, what could be described as ‘intense’. I have been described as intense by a past employer in a negative way and I have allowed it to affect me. But let me tell you what you will find when you are lucky enough to befriend such a personality. Intense people are open, what you see is what you get, there will be no heirs and graces, pretences, trickery or underhanded or devious action on their part. This is not second nature to them and so they will have to try extremely hard to be so. This becomes too exhausting and they will fall back to their natural way of speaking before thinking, wearing their hearts on their sleeves. Intense people are deeply loyal and grateful to friends, and family, teachers and employers who are good to them, they would walk to the ends of the Earth for you. But are also deeply sensitive to any disloyalty toward them and will prefer to end relationships that are one sided and move on. Intense people are naturally caring and empathetic, advocate for the vulnerable. To see any person or animal mistreated causes them much upset and can often get them into trouble because they will wade in and stand up for any living thing they see as being mistreated or in need. They need a more emotionally even tempered friend/partner to help them see that they can’t save the whole world alone. Intense people are very creative and need to use their creativity as an outlet to stay emotionally sound. Using their creativity as a career choice will bring much happiness, reward and benefit to them and their loved ones. Stunting their creativity will bring the opposite. So does my son know how amazing he is? Have I told him? Of course but not near enough! And as the sun starts to rise on this Christmas eve and I wait for him to come home this morning. I know that telling him again will be the best Christmas present I can give to him this year. I’m dressing the tree this morning, like millions of people around the world this week. I didn’t feel much like it his week, I haven’t been in the best of form. But my 13 year old knows it and is keen to jolt me out of this negative phase I’m in. I know he still has the most Christmas spirit in him out of all of us here and I don’t want to be guilty of knocking that out of him. So I’ve had my first coffee and still in my PJ’s I begin what feels like a daunting task. Every year I observe the fabulous Social Media Christmas tree photos and I get caught up in the competitiveness, every year I feel a sense of panic as if there isn’t enough to achieve that perfect Christmas tree photo, perfectly colour coordinated, meticulously styled… like the one I see… so I rush out and pick up a few extra bits on a budget to have ready to add. Reluctantly I began this morning to open boxes taken from the attic with the help of my 13 year old 2 days ago. And I sift through some old plastic baubles damaged by r a hungry mouse and the brass jingle bells rusted by the moisture from the home made salt dough decorations which appear to have melted in storage. But this hum drum chore begins to change into a beautiful sentimental reminder of times gone by… and so many of them happy and sad. 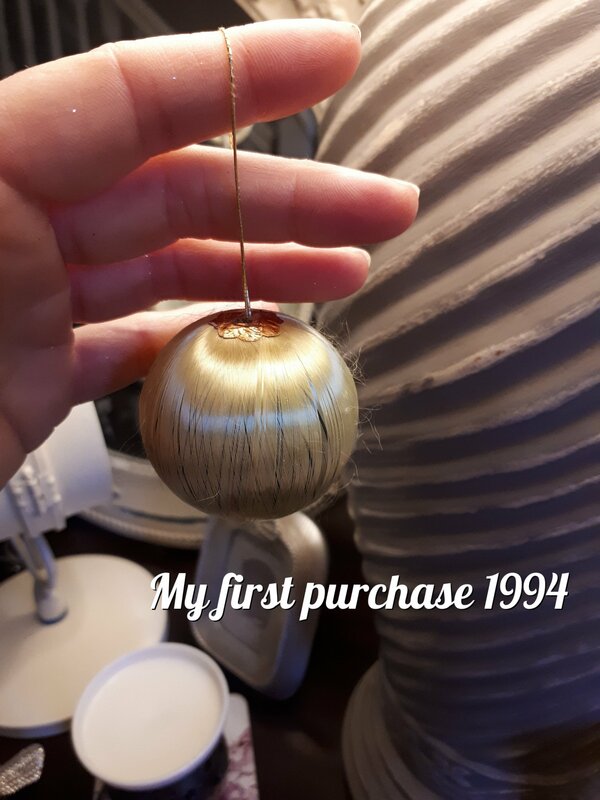 But all holding important lessons.I hold one tiny worn plastic cheap bauble, the only one remaining from a set I purchased where I worked for my very first tree in my very first home in 1994. It is one of those ones that would have been very common on the 70’s when I was a small child, you know covered in a fine layer of metallic thread. I think ‘why do I still have this’? 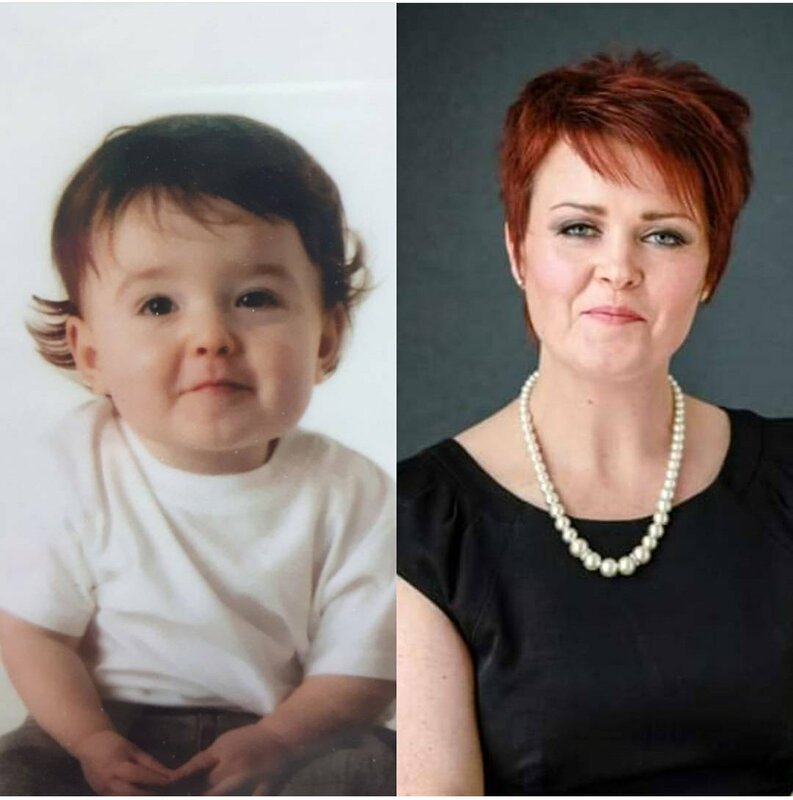 It’s ugly, the thread has become worn from it and it’s a reminder of some quite dark days of filled with confusion, loneliness, regret and domestic abuse. But I remember the reason I was drawn to it in the store the day I bought the set, it reminded me of my Grandparents homes a Christmas time and how the still living Grandparents still displayed with the kitsch multi coloured tinsel and the angel that looked more like a doll every year. And that made me feel safe and loved and warm inside. 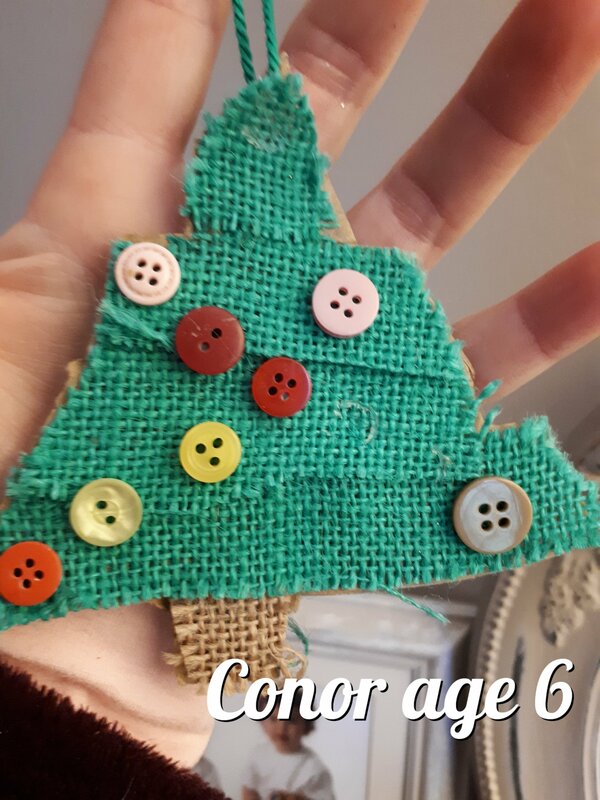 But then I see a beautiful handmade one from my son he had brought home from school aged 6 and the joy in me begins to rise… another one from my second child a tree made from cardboard burlap and buttons. Next appears a beautiful huge while bauble with the word ’Joy’ on it. It was a gift from good friend and neighbour Grace. Grace was the first genuine friend I had made when she asked me to mind little Peter in our new home in Pallasgreen 2006. 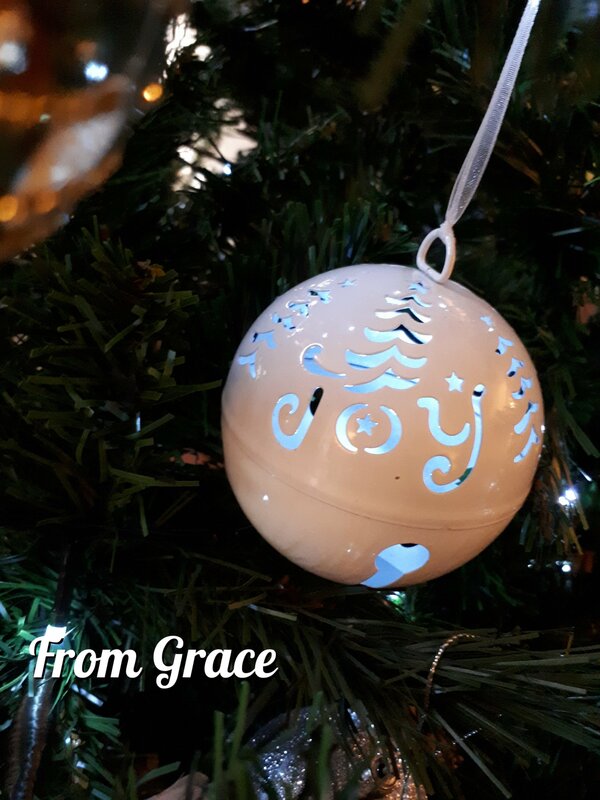 Grace is one of the kindest, caring, down to earth non-judgemental individuals I had the privilege to get to know and am still very luck to know. 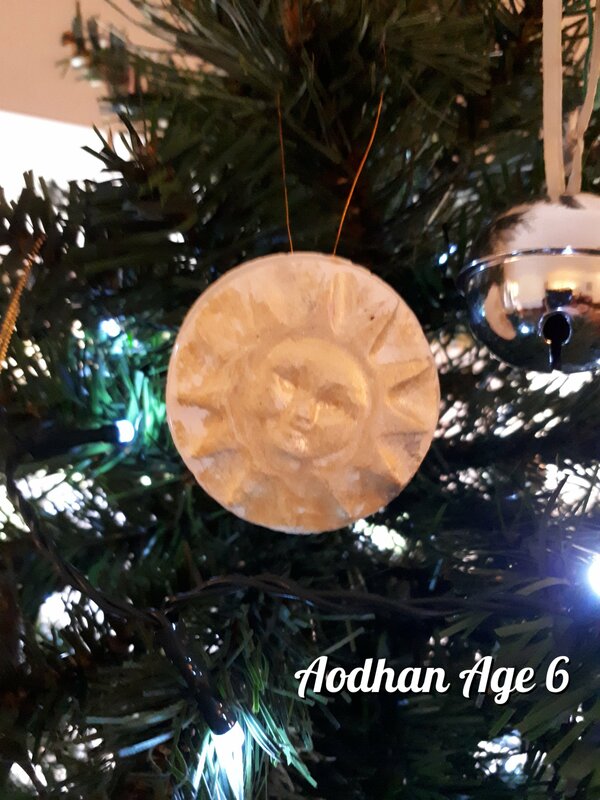 I see more memories before me in the form of various decorations such as ones I had bought for my husbands and mine first house and new tree in 1999. These represented a fresh start, love marriage and planned children. Others bought to add when the children were babies. Not a single one of them more than 2 euro each, but every single one with precious feelings, and life lessons attached. Then there are later ones representing more affluent times such as hand painted glass baubles and vintage look wood carved toys from Instore gifted to us by my Mother. 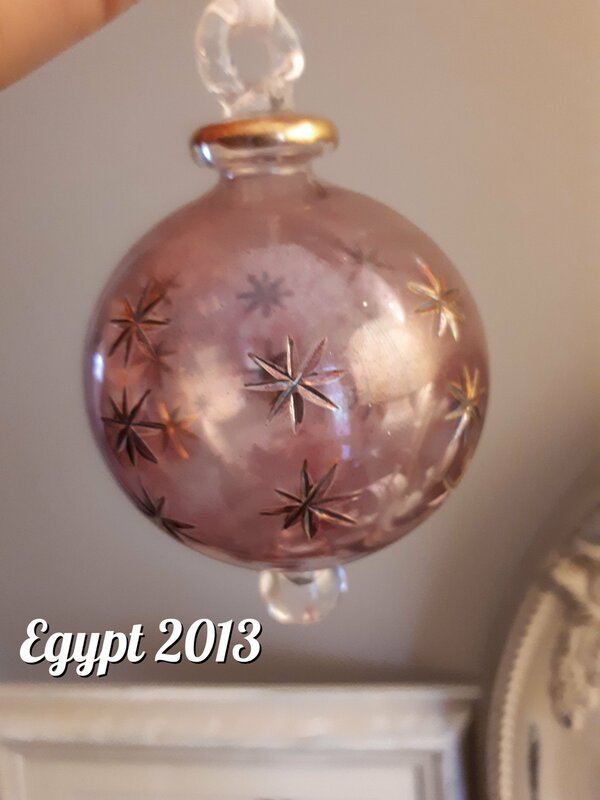 There is a single pink glass one, only one remaining from a pair purchased in Egypt in 2013 on a family holiday, where we took in so much culture and appreciation of another way of life different from our own. And some Newbridge Silver ones from Parents of children I took care of. Lastly the Angel the tatty old Angel who I consider swapping for a new shiny star comes out and she looks beautiful to me, beautifully aged with shredded dress and wonky wings. And I place her with pride and gratitude on top of my tree. And it looks like those new tree decorations weren’t necessary after all. The tree is beautiful. Hi! 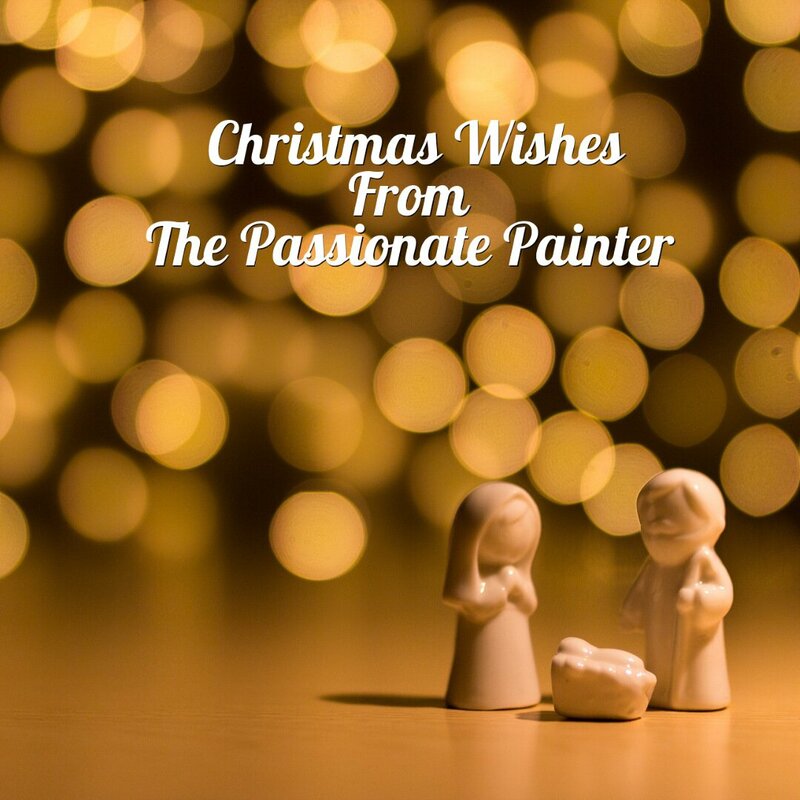 I’m The Passionate Painter. I was given this name by colleagues who see the passion I have for beautiful interiors and Quality paint finishes. I’ve always loved to paint but didn’t always have the know how to implement quality. It was due to many experiences of hiring the wrong guys for the jobs and thinking ‘I could have done a better job on that myself’! They say ‘Any one can take on a paint project’, not everyone should! So I’d like to share some tips with you based on my own experiences through the years. This particular article is for those looking for the right professional for their Kitchen refinish. Not thoroughly cleaning and prepping surfaces before painting will result messy results. I’ve had the spiel given to me in my days of inexperience ‘Oil based paint can be applied over any old surface and stay there’ NOT SO! 2. Using any household cleaner to hand to clean before painting. I once worked with a painter who was either so disorganised or lazy he didn’t bother to buy his painters cleaning product before starting a job. So he rooted the householders’ cupboards to find some CIF spray and used that. To this I say, (a.) if your painter hasn’t bothered to prepare before beginning the project that screams alarm bells. (b.) There are some brilliant painters who swear by some household cleaning products to do the job, but I say if it hasn’t been tried, then it can’t be trusted. Better safe than sorry, the cleaning and prep is the most arduous part of the job but so vital, so insist on knowing what your painter intends to use for this stage. 3. Using the ‘Paint it quick and paint it thick method’. This is a huge no-no if a perfect finish is desired. Many who call themselves professional painters or their teams will just want to get the job done, get paid and get out. No… and I mean NO paint product will magically will replace the effort of properly applying the correct amount of coats, with the correct tools to achieve the desired ‘perfect finish’. Applying paint quickly and thickly will result in tidal waves, brush strokes, stippling effect, drops and drips and splashes… I could go on. But I think you get the picture! Result…Your ultimate nightmare kitchen. 4. Forgetting to fill gaps, joins and holes. Particularly where old hardware used to be. If a painter tells you that filling the old holes where the old handles used to be is ‘not my job’, then quickly move on to the next one. Even if you haven’t decided on your new handles yet. Chances are the screw holes for them will need repositioning. The old holes should be filled, evened out and painted until it looks like they never existed. This should be done by your painter, who should be making the effort to find out if you do intend to change the hardware so this can be accounted for. Taking interest in those details are a sign of an enthusiastic Professional painter. 5. Painting doors whilst still attached to the carcass. This one is MASSIVE no-no. Many people just assume and don’t ask if the doors will be removed. This is another dream kitchen to nightmare kitchen scenario I’ve seen first-hand. No painter, no matter how experienced or steady handed will achieve a tidy professional finish on your kitchen cupboards while they still hang on their hinges. 7. Telling you he is so quick he will refinish your kitchen in record time. If this is so, then you can be very sure that all if not, most of the above short cuts will be implemented. You may be initially delighted with the apparent cheap labour and change of colour. But trust me… upon closer inspection you will see many amateur errors and most likely in time, many peeling, flaking and fading surfaces making you wish you hadn’t fallen for the lowest and quickest contract. It really does ring true that QUALITY TAKES TIME! Hopefully that didn’t scare you out of thinking about revamping your kitchen! But serves to arm you with the facts and the confidence to find your ideal painter and your perfect new Kitchen to enjoy, love, cook and entertain in for the next 10 years at least!